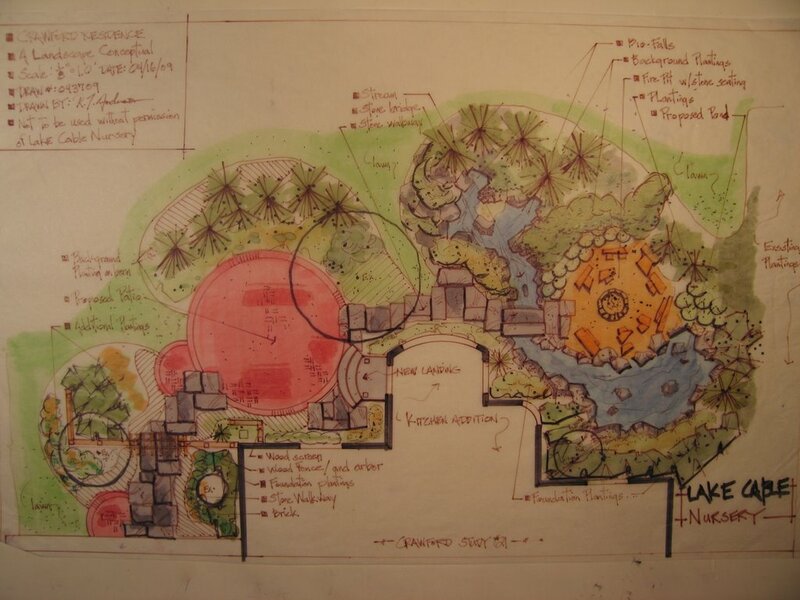 This is the plan view drawing for a project from a couple of yrs. ago. This was done after the drawing below was presented to the client. Here I am trying to show; in scale, how everything relates in this space. Patio, bridge, stream, pond, waterfalls, firepit, and plantings. This was the 1st drawing that was shown to the client, this speaks to how the owners would actually relate to their new backyard space after the kitchen addition had been added on. The idea was to show how they would be tucked into a nice comfortable room with a pond on one side and a fully planted berm and on the other. It also show how the screen planting might relate to the new addition. This rendering (sectional) really shows ” possibility”. Something you can not get plan view drawings to do. Renderings also allow for the dialogue to begin between homeowner and designer-working down a path to create the best possible space for the homeowner to enjoy, and live in. Hi Rick. Wow. I am a 2nd year landscape architecture student in Australia. I was just looking through some of your blogs and sections and plans. They are amazing. Really I never thought of using water colours I will give it a go. The stuff I have seen is inspirational. I was wondering if you could post up some more? Next PostNext More on the Dozer, and the Mounds.